UTech, Ja./Fi Wi Jamaica Project Activities Impacting “Dreams for a Better Jamaica” — UTech, Ja. Prof. Colin Gyles (right), Acting President, University of Technology, Jamaica (UTech, Ja.) welcomes Hon. Audley Shaw, CD, MP, Minister of Finance and the Public Service at the UTech, Ja./Fi Wi Jamaica Town Hall Forum on “Our Dreams for Jamaica,” held on Wednesday, November 23, 2016 at the Montego Bay Convention Centre in St. James. Prof. Rosalea Hamilton, Vice President, Development and Community Service, UTech, Ja. and Director, Fi Wi Jamaica Project looks on. 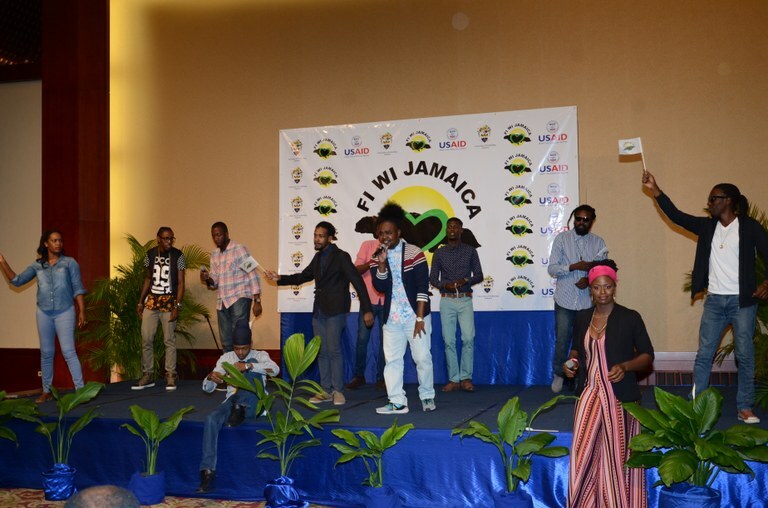 The Fi Wi Jamaica USAID funded social intervention and human rights project has further advanced its mission for a better Jamaica through a series of events and activities dubbed, “Dreaming of a Better Jamaica,” held in Montego Bay, St. James from November 15 – 23, 2016. The “Dreaming of a Better Jamaica” series included civic responsibility workshops, a silent protest dubbed, “Stand for a Cause,” Community "Soup with a Message" Day at the Granville SOS Children’s Village and Granville Place of Safety, an International Men’s Day Symposium and culminated with a Town Hall meeting in collaboration with National Integrity Action (NIA) aimed at fostering a public/private social partnership to promote civic responsibility, integrity, respect, tolerance and other Vision 2030 core values necessary to enable Jamaica to achieve national priorities. In attendance were representatives from government, non-government organisations, tertiary institutions, community-based organizations, citizens of Montego Bay and surrounding communities. Prof. Colin Gyles, Acting President, UTech, Ja. in his welcome at the Town Hall, noted that the “Dreaming of a Better Jamaica” initiative was a timely response to recent incidents of crime, violence and high levels of detachment from our systems of governance and democracy,” adding that, freedom from fear of crime and violence and freedom from discrimination and injustices are among our compromised liberties that we must seek to have restored and respected. Prof. Gyles expressed thanks to the (United States Agency for International Development) USAID for providing funding support to the University for the execution of the three-year Fi Wi Jamaica Project as UTech, Ja. and to partner, NIA for the various interventions implemented to assist in the transformation of values and attitudes for a better Jamaica. Prof. Gyles urged everyone to be a part of the collective response as we seek to build the future of our country. Prof. Rosalea Hamilton, Vice President, Community Service and Development and Director, Fi Wi Jamaica Project, provided an overview of the 3-year Fi Wi Jamaica Project which started in May 2015. She explained that the key project activities are evidence based dialogue; programming and policy outcome; access to social services for personal well-being and growth; engaging popular culture to create a space for change and transformation; proactive response to trafficking in persons (TIP), combating domestic violence and intimate partner violence, effective partnerships to promote women/girls empowerment and building public demand for change. Prof. Hamilton shared findings of a survey which measured civic responsibility and community engagement in Jamaica. She lamented that the survey revealed decreased participation of community groups and organizations such as PTA meetings, community improvement associations and religious organisations. She also noted that there is also troubling gradual increases in support for vigilante justice and illegal protest action. 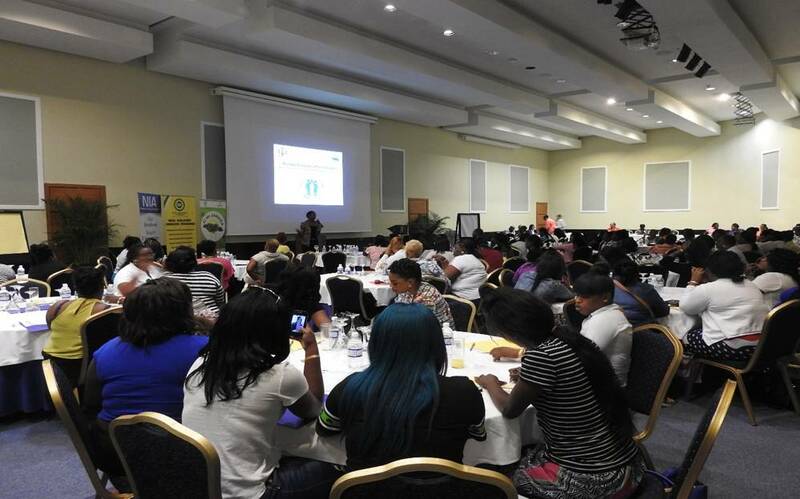 Women from communities in Montego Bay, St. James participate in a Fi Wi Jamaica “Women in Crisis” Capacity Building Workshop held November 16 - 17, 2016. In highlighting the outcomes from the workshop, Prof. Hamilton outlined the 10 Point Priorities articulated by the groups for a better Jamaica: Education, more jobs/decent work/entrepreneurship/decent pay, good governance, improved health care system, better infrastructure, crime and security, protection of the environment, greater protection for young people/children, equal justice and access to resources and investment, growth and development. She underscored that these are closely aligned to our seventeen (17) Vision 2030 National Priorities and therefore urged government to prioritise support in this regard. Hon. Audley Shaw, CD, MP, Minister of Finance and the Public Service who was guest speaker at the Town Hall acknowledged that if Jamaica is to become a prosperous nation we need to practise good governance with zero tolerance for corruption, invest in education and become more productive citizens. He lamented the increasing propensity of Jamaicans to facilitate corrupt practices and allowing them to become the norm in our society. He called for Jamaicans to reject corruption in all its forms, particularly the popular lotto scamming scheme in an effort to protect our country from these practices that erode our social and economic well-being. He pointed out that Jamaica with its endowment of natural resources has achieved an insignificant economic growth rate of 1% per annum for the past twenty years, adding that it is impossible to create wealth unless we return to significant rates of economic growth. Addressing the importance of education in this regard, Minister Shaw called for our young people to be taught the importance of discipline and hard work and an appreciation for zero tolerance for corruption. He also called for greater participation from Jamaicans in informing governance processes so that they can help to transform their communities and by extension their country. In discussion from left at the Town Hall are Prof. Colin Gyles, Acting President, UTech, Ja., Mr. Andrew Colburn, Director for the Office of Citizen Security, USAID/Jamaica and Dr. Rosalea Hamilton, Vice President, Development and Community Service, UTech, Ja. and Director, Fi Wi Jamaica Project. Mr. Andrew Colburn, Director for the Office of Citizen Security, USAID/Jamaica in his remarks said that the USAID was pleased to be collaborating with UTech, Ja./Fi Wi Jamaica Project and the NIA to assist in providing support to victims of crime and violence in the society. He acknowledged that Jamaica has the potential to achieve more than it has in the past but there are significant challenges that must be addressed especially in the areas of crime and violence, the trafficking of persons and the sexual exploitation of women and children. He also highlighted judicial backlogs which continue to hamper access to justice for victims. He expressed hope that much of these issues can be addressed through the various initiatives and interventions of the Fi Wi Jamaica Project and pledged the continued support of the USAID in this regard. 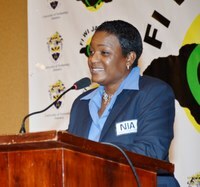 Dr. Patrice Charles, Deputy Executive Director, NIA who brought greeting, expressed that Jamaica has a lot to do to tackle corruption. She noted that after four and a half years of successful awareness building and representation related to the combatting of corruption by the NIA, Jamaica’s ranking on the Corruption Perception Index (CPI) has improved significantly. Dr. Charles shared that Jamaica has advanced sixteen places ranking 69 out of 168 countries in 2015 compared to a ranking of 85 out of 185 countries in 2014. She noted that the improvement for greater demand for accountability and public awareness are also linked to the activities of civil organizations and interventions by the Fi Wi Jamaica Project. She called for all civil organizations and groups including the Fi Wi Jamaica Project to continue their work to ensure the effective building of integrity and civic pride among Jamaicans. Dr. Patrice Charles, Deputy Executive Director, NIA brings greetings at the Town Hall Forum. Seated in the front row from left are His Excellency Eduardo Javier Bonilla Menchaca, Ambassador of Chile to Jamaica, Dr. Maureen Nelson, Acting Principal, Montego Bay Community College, Dr. Michelle Pinnock, Regional Officer, Ministry of Education and Dr. Joseph Grannum, UTech, Ja. Western Campus Coordinator. 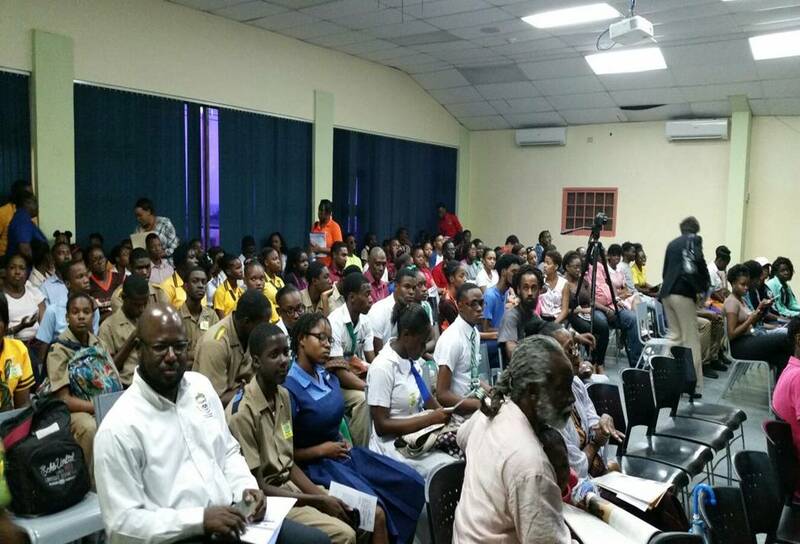 The Fi Wi Jamaica project has been strongly supported by tertiary institutions in Montego Bay including Montego Bay Community College, Northern Caribbean University, Sam Sharpe Teachers’ College as well as the Social Development Commission (SDC) and the Ministry of Education whose representatives all endorsed the project during the Town Hall forum. They expressed hope that project would impact the entire Western Jamaica by enhancing the social and economic development of those persons who live in vulnerable communities. The Fi Wi Jamaica Masters-in-Residence Training programme led by Mr. Michael ‘Mickey” Bennett, producer and Music/Cultural Director, Fi Wi Jamaica Project showcased his prodigies during the town hall meeting with the Project’s theme song, “Walk Wid De Dream” and other musical outputs from the Fi Wi Jamaica Project. The Masters-in-Residence Training Programme provides coaching for new and established artists combining lectures and workshops to introduce them to professional mentors and the art of performance. Members of the Fi Wi Jamaica Masters-in-Residence Training programme entertain the audience with renditions of songs from their repertoire during the Town Hall Forum. Participants at the International Men’s Day Symposium Titled, “Scammer Dem Deh Yah” held on November 17, 2016 at the Institute for Gender and Development Studies/ University of the West Indies (UWI), Mona, Western Jamaica campus. The symposium explored integrity, violence, and masculinity in Jamaica. 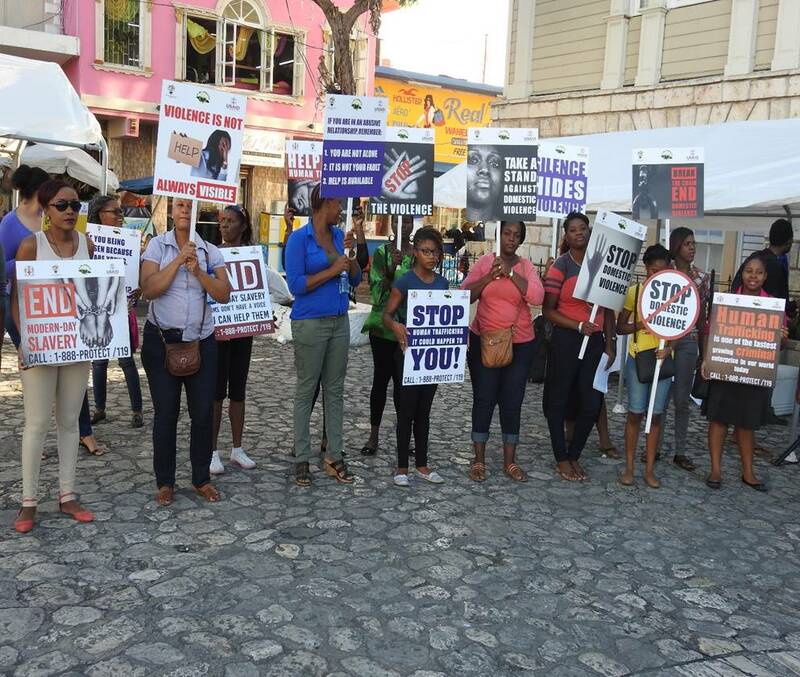 Protestors display placards advocating for an end to crime, violence and human trafficking during a silent protest, dubbed, “ Stand for A Cause” held on November 21, 2016 at the Civic Centre, Sam Sharpe Square, St. James.